Boat season is fast approaching. Are you interested in the boat transport process or seeking to learn more about yacht shipping? 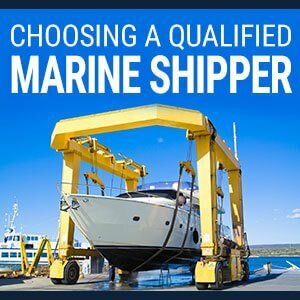 Those seeking information on how to ship a boat or how to make money shipping a boat to the U.S. can follow these 10 easy tips. If you are a consumer seeking information on how to ship a boat, look no further! First, you should always plan at least a month ahead before your boat arrives. This gives you time to find a boat carrier, shop around for boat shipping quotes and schedule boat transport pickup and arrival dates. Make sure you have accurate boat dimensions to receive the most accurate boat shipping quotes, thus avoiding delays and unforeseen costs. This makes it easier for boat transport services to estimate the equipment they need to ship your boat. Include replacement value, measurements, special requirements and photos to help shippers plan for your shipment. Remember some boats are oversized, over dimensional and overweight. Whether you are buying a boat or importing a boat, you must plan ahead. Boat or yacht shipping typically requires you to apply, pay and get approved for permits for these types of shipments. Boats hauled by trucks on state and federal highways may even require escorts to run both in front and behind your boat cargo for both safety and legal reasons. How much does shipping a boat from Europe to Asia or from Europe to the U.S. cost? The cost to ship a boat all depends on the distance your boat is traveling. If you are shipping a boat across the Atlantic Ocean, you can prepare to spend a lot more than you would if you’re shipping a boat across the continental United States. The price of shipping a boat or moving a yacht is always difficult to estimate so leave some room in your budget for some surprise fees you may have forgotten to consider. Spend some time to do the preliminary research needed to calculate your costs to make your budget accurate. Hauling oversized shipments take extra time and effort. If you are hauling a boat on a tractor trailer, remember that those trucks aren’t driving the speed limit. It can take a tractor trailer with an oversized boat on it hours to drive through just one state. Permits distributed for oversized loads also usually require trucks to only drive those roads during allotted time periods and during good weather only. It is important to review insurance policies for your boat transportation. Make sure you verify your policy coverage through the Department of Transportation. This type of insurance is needed when providing assistance for your oversized cargo on state and federal highways. You should also obtain your own coverage for any boat you are shipping or importing from Europe or any other country. We offer cargo insurance through our network of supply chain companies and can walk you through purchasing additional insurance when needed. A bill of lading listing your boat or yacht purchase in the form of a receipt. An arrival notice from the U.S. agent of record. A packing list detailing your boat or yacht purchase in detail. A commercial invoice listing the purchase price, tariff classification of your boat and the country of origin for your imports. Other countries make their own sets of rules and regulations when it comes to exporting boats and yachts. Make sure you do your research and get the proper import duty, or tax, for your boat imports, which require a customs bond. Have questions? Click the bottom right box to chat and we can answer you right now! You are importing goods like boats and yachts that have a value in excess of $2,500. These types of goods require a customs bond. You need approvals expedited quickly with the U.S. Customs and Border Protection (CBP) quickly. Customs bonds are required for boat imports. 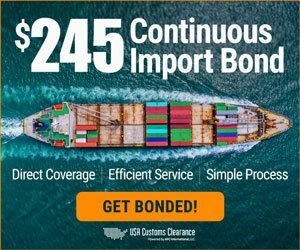 You need the proper customs bond to achieve customs clearance success. There are two main customs bond types to choose from. Figure out the customs bond type you need today. Does the boat importing process seem overwhelming? Contact AFC International today to streamline the importing process for you and put your mind at ease. The skillets that a Licensed Customs Broker provides can make the import process move quickly and efficiently. Our value-added customs brokerage services work seamlessly to provide you with a stress-fee importing process. Clear customs easily with us today by requesting a customs bond quote! We are here to serve you!